"Voted Best Pest Control Co. 2018"
Each season brings new pests. Stay protected all year long with our comprehensive Home Protection program! Keeping your business pest-free is serious business, and we can help. Want proof? Call us for references. Bed bugs are becoming a serious epidemic all over the country. Catching an infestation early on is critical. Termites are nature’s recycler. Protect your biggest investment from these insects. These pests are looking for shelter in your home! We will make sure they know they’re not invited. Has your pet been itching lately? It takes six weeks for one flea to turn into one million fleas in your home. With our fleet of 30 royal blue Volkswagen Beetles and our killer service, we've been protecting homes and businesses in the Kansas City metro since 2003. 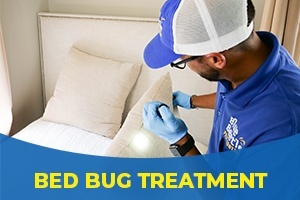 We offer specialized treatments for bed bugs, termites, roaches, mice, mosquitoes and more! No matter what's bugging you, there's no pest challenge our team of heroes can't solve. 2019 - Blue Beetle Pest Control © All Rights Reserved.